I’ve often thought surveys are the most brutal and easy to manipulate form of market research. And yet they remain so compelling. – The audience’s situation at the time the research is conducted directly affects the outcome. Yet the immediacy, simplicity and inclusiveness of people participating in a poll are still seductive and compelling to researchers, marketers and consumers. 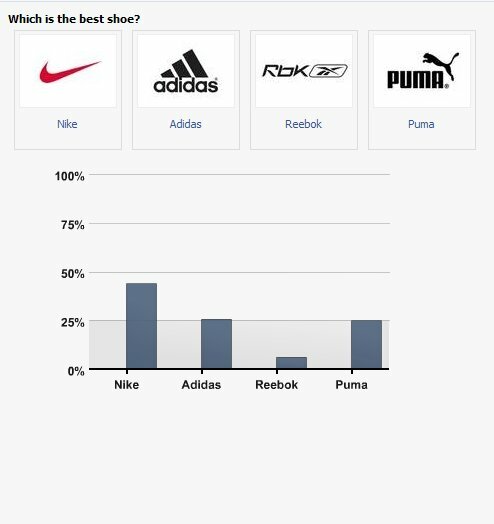 There is a widget on Facebook that provides a daily survey and today’s happened to be on sports shoe brands. While the findings for the purpose of my point are irrelevant, I’ve included the chart below. The interesting thing about surveys within social networks is that they are able to amplify brand perceptions, which in turn help fuel trends. The views expressed in the poll are at the same time compelling and misleading. They represent a blur of the picture I think, as many marketing people worry about the perception of a brand within their own country or region. While social networks are still commonly biased by language and social class and lifestyle interests. A survey of Facebook users means an international survey of predominantly white, wealthy and 18-34 demographic across multiple western countries. A broad but still influential group for many brands then. Social networks are the new neighbourhoods – a membership community that is built around friends, peers and ‘people like me’ (which psychologists will no-doubt describe as ‘people I hope will like me’ as acceptance and popularity is a key part of the social network dynamic). The natural tendency is for members to think about being an individual, sharing photos, preferences, news that is about them. But the hope of the individual is that you fit within a group, finding social connection and acceptance from others whose acceptance you value. So when you look at Facebook surveys, even fun ones with no thought or malice intended in their origin, they have the inherent ability to shape and inform your opinion as member of that community. The ‘I just heard’ or ‘I read somewhere’ parts of our lives used to be filled by journalists as much as advertisers or the opinions of friends and family. With social networks, the voice of authority and information starts to derive from a shared contribution and opinion. From a consumer/user point of view, these surveys are the views of the peers you are trying to be part of a community with. So while you participate to have your voice heard and contribute to the vibrancy of the group, you are also informed and swayed by the survey findings. There is a homogenising effect here, where the beliefs of the opinion informers eventually impact on the performance of a brand in any market. When other word-of-mouth (or word-of-social-network) chatter is added to the fray, brands will find the speed of change within a consumer groups view from social networks an increasing challenge. Timeframes for opinions being disseminated and brands being adopted or rejected are shrinking. Surveys for the people, by the people, are simple to create on social networks and I believe add another community generated content element that facilitates the increasingly rapid flow of information and opinion amongst articulate and net-savvy consumers. The pull of surveys to marketers relates to their simplicity; ‘I asked and the people said.’ However simplicity is easily confused for clarity or truth. Why people say what they say is not explained and is rarely straightforward or as pithy as a survey answer. So while a survey reveals an answer, it’s often one that lacks insight to the important reasons and issues so fundamental to promoting a brand’s health and identifying the cause of malaise.